We are a lively Church in a prime position of suburban Penwortham – Two miles from the centre of Preston. We meet for worship on Sundays at 10.30am and 6.30pm. Sunday School also meets at 10.30am. The children come into church part-way through the Service the weeks we have Holy Communion and they are invited to take part should they want to. We have a Messy Church which is on the last Friday of every month from 6pm - 8pm. Messy Church is a way for people to spend time together as a family, having FUN making a mess and sharing food whilst learning about God. Everyone - of any age is very welcome. 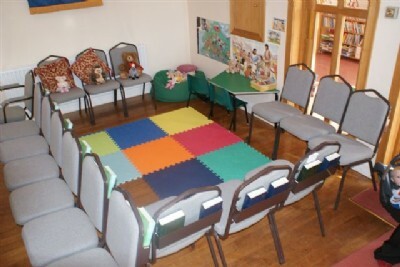 There is also a play corner for the tiny tots. (See picture) Our modern premises are well-used throughout the week, with fellowship meetings and youth activities. House groups meet once a month for Bible study. Our all-ladies choir has a strong social life as well as producing attractive music for worship. Our 130-seater church is dual-purpose and can be adapted easily for formal and informal worship and social events. We also have a well-used fellowship room, with a secondary meeting room and prayer space upstairs. Our purpose-built Youth Hall is busy five evenings a week with Rainbows, Brownies & Guiding activities (see Contacts List for details), but has space available for other activities during the day. The premises are extensively adapted for disabled users, with ramped access and purpose-built toilets to church and Youth Hall. Both church and fellowship room are also fitted with loop systems for the hard-of-hearing. Like other Methodist Churches in South Ribble, Kingsfold is a practising Fair Trade Church.